This script allows you to create negated conditional branches in your events. For example, if your conditional branch tests “if actor exists”, then the negated conditional branch tests “if actor does not exist”. The purpose is to provide negation logic without having to figure out how to write the condition as a script call. Forgive me if I overlooked something, but what benefit does this script serve? 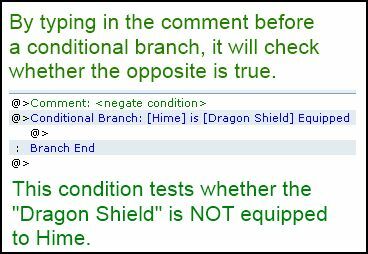 – Couldn’t you just as easily check a condition, leave the “true” branch empty, and fill in the “else” branch?